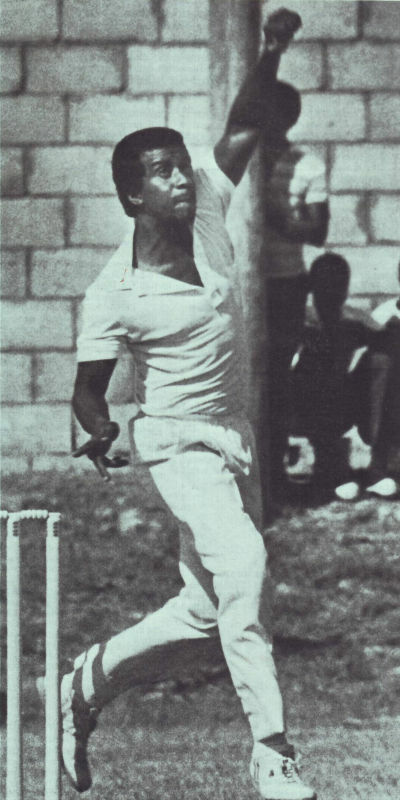 Slow left-armer Elquemedo Willett was the first man from the Leeward Islands to play for West Indies when he made his debut as a 19-year-old against Australia in 1972-73. He took two wickets, and five in the next two Tests - including his best of 3 for 33 at Port-of-Spain. In was enough to ensure he toured England in 1973, where he took 30 wickets but was unable to break into the Test side. He then toured India and Pakistan in 1974-75, taking two wickets in each of his Tests. But in an era when selectorial consistency was not to the fore, another chance never came, and with the advent of West Indies all-pace attack, he faded into the shadows, although he carried on playing for another 14 seasons. While his impact on the field was limited, his inclusion in the West Indies side had a massive impact on cricket in the Caribbean's smaller islands, where players had hitherto felt ignored. Derick Parry was an offspinner whose batting was almost good enough to classify him as an allrounder - he ended with a career average of 26.86 without ever making a hundred. He didn't pull up too many trees in his 12-Test career, but the fourth Test in Trinidad against Australia in 1977-78 was his finest hour by a long way. Parry dug West Indies out of a hole with a Test-best 65 in the second innings, then took 5 for 15 - the last four all bowled - as Australia collapsed to 94 all out. It was Parry's only five-for, and it gave West Indies the Frank Worrell Trophy. His chance came about because of the Packer defections. His debut started poorly - he was dismissed first ball, and then his first delivery was a wide. But he rallied with a second-innings fifty, and was selected to tour India in 1978-79 but didn't enjoy a happy trip. He managed 170 runs in the six Tests and took nine wickets, but nevertheless remained in the squad for trips to Australia and New Zealand, England, and Pakistan. The return of the World Series players and the plethora of fast bowlers ended his international career, and his disenchantment caused him to throw in his lot with the rebel West Indies side which toured South Africa in 1982-83 and 1983-84. He received a life ban from the West Indies board, although he played for Cambridgeshire for several seasons. Life at the top was a mixed bag for Keith Arthurton. A dashing left-hander and an outstanding cover fielder, he certainly had his moments: an unbeaten 157 at Brisbane in 1992-93, a century against England in Jamaica in 1993-94, and a flurry of strutting seventies. But for all the bluster, Arthurton - only the third Test player from the small island of Nevis - was never quite as good as his Caribbean predecessors: he made eight ducks in 33 Tests, and his international career never recovered from a horrible 1996 World Cup, in which he made two runs in five innings. Stuart Williams was the romantic young strokeplayer who was expected to mature into a steady item for his team. Instead, his cavalier method - step back and strafe everything through the covers - became increasingly stereotyped as his career wore on. The high point was a lone Test century, made against India, but Williams has passed fifty only four times in 52 innings. He earned an unexpected second chance when India toured the Caribbean in 2001-02, but it was the same old story - 91 runs in five innings, the majority in boundaries. In 2004 he had a finger amputated after a fielding accident in a Carib Beer series match. He was a sharp fielder in the gully. He later became a selector and, in July 2008, was was named in the national selection selection panel headed by Clyde Butts. Fiery on and off the pitch, Runako Morton's cricket career looked to be dead in the water when he was expelled from the West Indian Academy in July 2001, for a series of regulation breaches. He refused to be bowed, however, and continued to accumulate runs for Leeward Islands in the Busta Cup. In February 2002, his penance complete, he was called into an injury-plagued West Indian squad as a replacement for Marlon Samuels, and was tipped to become one of the few Test cricketers from tiny island of Nevis. But he threw away his opportunity when he pulled out of the ICC Champions Trophy in September 2002, after lying about the death of his grandmother. His career slipped further down the pan when he was arrested in January 2004, following a stabbing incident, but in May 2005, he was given a third chance at redemption when he was recalled to the one-day squad to face South Africa although he didn't get a game. He got his chance later that month against Pakistan at home, and was then picked for the 2005-06 tour to New Zealand, where he proved his worth with a fighting century - his maiden one-day hundred - in a losing cause. He followed it up with another ton, in the away series against Zimbabwe, but soon made it into the record books for his painstaking 31-ball duck in the final of the DLF Cup against Australia in Malaysia. It was the slowest ODI duck, beating Phil Simmons's earlier record that had consumed 23 balls. It certainly got his eye in, however, as Morton made an unbeaten 90 in his next meeting with the Australians, in the Champions Trophy. From that moment on, however, his form fell away, and he was omitted from the West Indian squad for the subsequent World Cup. He won a recall for the tour of England in 2007 and then beat up on Zimbabwe in a lopsided ODI series, but was left out of the Test side to take on Sri Lanka after a disappointing series in South Africa. Today, there have been 26 visitors (68 hits) on this page!